This is just a quick guide to those who are new to the game or if you have just created a baby sim and don’t really know what it does! To unlock babies you need to complete the two and a half sims quest first! Firstly to create a baby you need a cot placed in the house of a married couple, when you see the blue add sim circle above the cot you are ready! Creating a baby costs 3LPs or simoleons (if you have completed the life dreams and legacies quest) the simoleon cost varies depending on how many other sims you have in your town already. Once you have the baby you can change its name, choose its gender, eye, skin and hair colour and outfit. You cannot change the name, gender or skin colour again unless you use the ultimate makeover which costs 12LPs. They can also use the sofa to practice balancing and exercising legs and interact with dogs and cats! Musical Expressions hobby- complete the Nanny Knows Best quest to unlock the xylophone to start this hobby! Babies can interact with teens, adults and seniors, they cannot interact with toddlers or preteens. How can you move a baby and crib/cot? I relocated my family and the baby and crib were relocated directly in front of the stove in the kitchen. I had the parent cuddle the baby, thus picking it up of the crib, but that did not allow me to move it either. have you tried to move it while the baby is in the crib? It was part of the Christmas 2012 update so I don’t think you can get it, sorry! Hi, I had a baby and I can’t do any interactions with it. Every person when I click on a action, it gets the air bubble with two foot prints. My baby is loosing energy on everything! I need help asap! I can’t seem to find any help when I look it up. I made a birthday cake for my baby but it didn’t age the baby. I clicked have a birthday again but it just asks if I want to buy it again. Is there anything you have to do after making the cake? I don’t think you are actually purchasing anything, I think they just say that to make sure you are using the cake on the right sim? So I started the process of the stork bringing me my baby, then I relocated the household into a new bigger house. I thought baby would go eith them but it didn’t. The crib is stuck in the old abandoned home. I can’t cancel the task and I can’t store the crib because its being used. How do I get baby with its parents? Mayby you can help me 🙂 I get a baby again, but now the baby cost 47000. Do you know why it suddenly cost so much? First, just wanna say thanks for all the information you’ve provided me with. I actually have a question about babies. If I moved in a couple that are at “partners” together, but that are not engaged.. Can I still marry them once they live together? & if so, can they still have babies? That was a gift from completing a Christmas 2012 quest, it isn’t avaliable anymore, sorry! hi there, I can’t seem to put my empty crib in my inventory. I can’t sell it either. I only have the rotate and tick option when I click on it. Thanks for your reply! I checked and you are right. I have a baby ready and I didn’t realize it! I must have clicked on the crib to add a new baby accidentally. 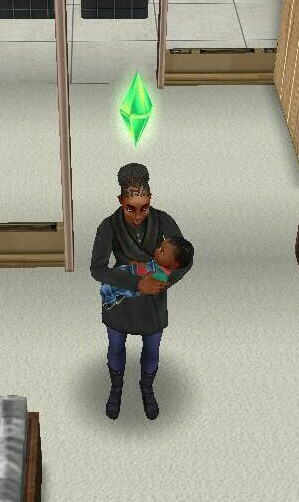 Now I have a baby I was not planning to add but its alright since I had space to add 2 sims. I managed to add a new sim to my town after that. Thanks again! You’re welcome, I have done the same thing myself! I Have An Extra Crib In My House And It Won’t Let Me Put It In The Inventory. How Can I Put The Crib In The Inventory Without Having To Delete Or Restart The Game ? I’m on level 13, I haven’t done the quest for toddlers because I don’t remember seeing it. How can I age my baby to a toddler? What quest are you on now? You need to complete them in order so you have probably just not got to that quest yet. I noticed that if you accidentally leave the game for more hours than you intended, babies become very sad. (I’d be sad too with a wet diaper, cot, no formula, no cuddles, and only four hours’ sleep.) The meters were lower but not red, but no matter how often a parent did the diaper spin, they still had stinky face and crying baby. I finally decided to try hibernating the baby to see if it either helps to give a tired, cranky baby some decent sleep, and/or gives me a cupcake to use. Any other suggestions? Why must these poor children have to wear those icky gray cloth diapers? And why not have them wear a onesie? During the diaper spin, the onesie could dissppear and reappear. Crying babies should make noise that wake sleeping parents, and make the parents go to the cot. Then the player will have everyone where they belong to get the parents to care for baby. All of these could be alternate options for attending to baby needs, and some that take more time (like bathing) could give extra XPs to keep the game moving along. As for the programming, just as Sims *should* have an “Be Affectionate” option, or at least keep the “kiss cheek” option available for all interactions for good friends through marriage (for example, I made two of my adult Sims sisters, who should have the ability to hug instead of bro-hug or, horrors!, chest-bump), parents should want to be with their babies. It drives me nuts that a parent Sim will wander out of house unless you’re playing with it, leaving baby alone. Frankly, I’d like all Sims to be programmed to stay in the same room you put them in until you move them yourself. And parents should also have an option for showing off new babies, with LP and XP rewards. This is my first Sims experience (as if that wasn’t obvious), so there may be reasons for these issues of which I am unaware. But here’s the thing, the programmers may see babies as a necessary stage while you take three days to do the steps needed to get a toddler, but babies are cute too, and the gaming potential for them is not being used. If a mother had programmed this, you can bet that babies would be much more interesting. P.S. Parents could also have an option or task for showing off the baby. Seriously, IRL, have you met anyone with children who doesn’t love to show them off and brag about them, especially first-time parents with babies? They may be sleep-deprived, but they talk about their baby constantly! Whether in their house or visiting next door, there is a lot of points potential here too. That happens to all sims if you leave them not going anything, select go to sleep and they will stay happier for longer. I don’t know, I don’t develop the game, I just play it like you. But changing the diaper is quick and doesn’t take long to fill up the hygiene. Oops on the onesie thing, I just had a new baby come from the stork today and saw that there ARE onesies available. But then when I checked the nursery dresser, it provided clothes changes for the adults, which I guess means the babies are stuck in the same clothes until they’re toddlers. No wonder they stink! (I hope toddlers can change clothes at least. At least they get baths.) Babies really do get short-changed in this game. Sad, b/c they are really cute! You need to click on the baby and then click on the dresser to change the clothes of the baby, you must have clicked on it using an adult. That is a strange glitch, I’m not sure how to fix this issue, they may just have to live in different houses with visits from his mum, sorry! I was wondering, if I have a couple and they have two babies then one of them grows up and moves out can I have another baby while in the process of the senior quest? I haven’t completed the senior quest, just started it. Thanks! I have a baby and a toddlers who’s dad had been murdered. Their mom has remarried, but now the mom and new husband live in a separate house. How can I combine the family so that the mom and her babies can live in their home with the new dad together? No after remarrying the mom moved in with her new husband, but the infant and toddler remain in the old house. I would like to move the mother and new husband in to combine the family, is that possible or do I have to kill the babies off too? I don’t think it is going to be possible, sorry! How can you take a baby out of its crib, and how can the baby take its first steps? My toddler won’t interact with the baby CAN YOU HELP PLZ?!?!?!?!?!?!?!? Toddlers can’t interact with babies, only teens, adults and seniors can. How much simoleons are a babie. it varies depending on how many people you have in your town. I have a question about whether parent Sims can go to work and leave the infant home alone? I have played other versions of Sims and normally you can’t. I have been leaving an adult sim with the babies at all times. Thanks! I just found your blog and I love it! I wisj I had found it before now as I have been playins Sims Freeplay for about a month. It does seem as if each person has different quests in different orders. Thanks again! I don’t know why, sorry! he can’t interact with it, it just goes over their crib. Do babies cry themselves to sleep? I have three toddlers (these are incredibly cute, even with poo in their pants) and a baby no one is paying attention to. Everything is red, and he was crying non stop but suddenly he started sleeping even if I did not put him to sleep. Automatically. If I wake him up via some command (and cancellling) he would go to sleep again. babies can fall asleep if their engry levels are low, maybe you should try taking care of the baby. They are quite low maintenance really, just feed, cuddle, entertain and change diaper, then they can sleep for 4 hours or a day. It isn’t really possible, the only thing you can really do is have his parents stay at the house with him unless they are going to work. A few of my sims spend a lot of their time at other houses and rarely go home. Hi, I just had a wonderful glitch. I have the latest update of 2015. 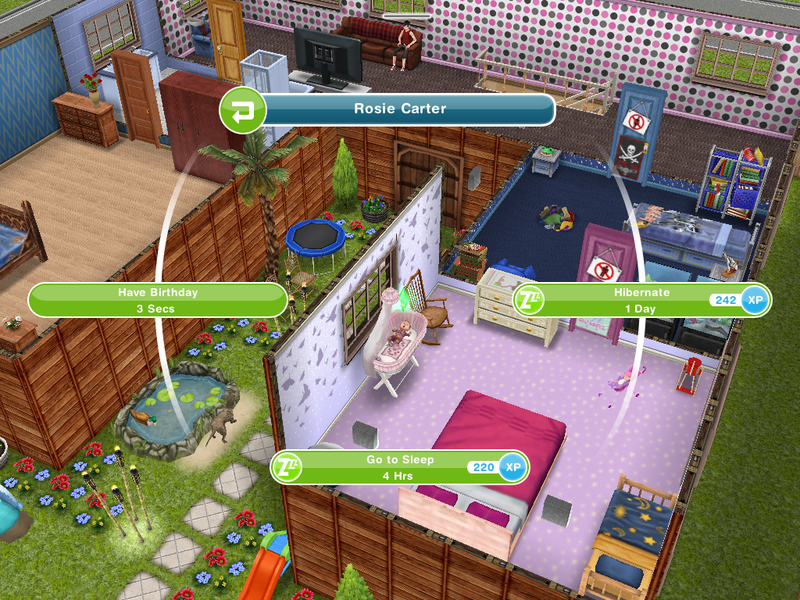 I was in the process of naming the baby when I was distracted and accidentally logged off Sims Freeplay. I signed back in a house different from the one with the baby, so I tapped the face of the father to get there, and it moved me to the baby creating font. After I finished, I suddenly have two babies, one of them didn’t have a name, while the other was lying on the floor. I bought a crib and moved her in, and I have two babies at the cost of one. Yeah, its a good glitch! My baby’s parents turned into seniors and died!! My baby is living alone! Is there anything I can do? Not really, the only thing you can do is have another sim visit the baby to look after it but you can’t move the baby to live with someone else and no one can move in. You know how it shows a pink or blue circle to show what gender the baby will be when its making? Well I have a girl already and I want a boy but it shows a pink circle around it can I change it to a boy? ?😭 thanks.